Leily Schoenhaus is an associate in the firm’s litigation department. She has handled significant matters in federal and state courts in New Jersey, Pennsylvania and elsewhere, at the trial and appellate level, as well as the Vaccine Court and the Court of Federal Claims. 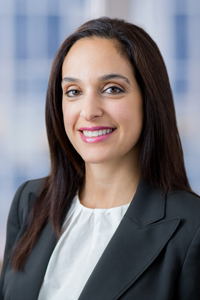 She has experience in a variety of substantive areas, including contract disputes and business torts and representing injured parties in cases involving product liability litigation, personal injury and medical/professional malpractice. She has assisted in obtaining significant settlements from pharmaceutical companies on behalf of individuals who have suffered injuries in clinical trials. Her clients include injured parties, individuals involved in first-party insurance coverage disputes and parties involved in business disputes. Before joining the Firm, Ms. Schoenhaus served as the judicial law clerk to the Honorable Ronald J. Freeman (Retired) of the Superior Court of New Jersey in Camden County.